There are two things at war in this new adaptation of Rudyard Kipling’s The Jungle Book. There are the absolutely stunning visuals, all fake but are still seamlessly integrated with the one real element in the film. Then there is the nearly lifeless way the story has been told. There is no denying that this movie looks good, but it manages to feel much longer than its 105 minute run time. Despite all the stars showing up to give voice to these characters the never manage to give any of them life. The movie just plods along, occasionally buoyed by a bit of humor or a call back to Disney’s classic animated version. The visuals are the real star here, so that is where I’ll start. This movie is a technical achievement, a movie about nature that convinces the viewer of the reality of its setting despite having no real nature in it. Director Jon Favreau and the effects team have managed to create gorgeous, realistic computerize generated jungle. The animals that populate it are expressive without ever looking like cartoons. Even the one real element, the boy who plays Mowgli, doesn’t stand out, instead his seamless interaction makes the rest of the movie look all the more real. This movie looks great. How great it looks makes it all the more sad that it tells it’s story with sagging aimlessness. It goes through almost all of the same vignettes that made up Disney’s animated version (or maybe their first animated version, with this one being the second) but nearly all of them feel like they are dragging their feet. The problem is not on the performers, with the easily recognizable cast giving largely pretty good performances, but on just how turgid the whole thing is. For instance, take the King Louie scene. 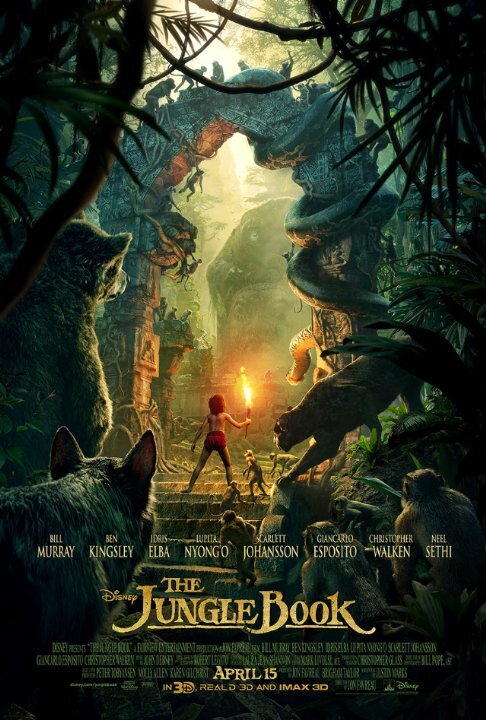 It starts with Mowgli getting kidnapped by monkeys, with the film showing them taking him through the trees, up a cliff and into a crumbling temple. Then he has a long conversation with Louie, a bright spot thanks to the inclusion of the old song. Afterwards, Baloo and Bagheera arrive to save him. This turns into an interminable scene where a fake bear and a fake panther fight fake monkeys. Except the monkeys can’t do anything to hurt the other two and they seem unwilling to do more than smack the monkeys around a little. It just keeps going on and on, perfect in its pointlessness. Meanwhile, Mowgli hides from Louie in the temple, leading to that scene you’ve seen a dozen times where he hides behind a pillar from his pursuer, who appears beside him after a camera pan. As soon as you see the pillars you know what is coming and movie never does anything more than exactly what you’d expect. The parts that work the best are the two songs, call backs to that animated version. And that is the big problem with this movie. As amazing as the visuals are, there is no life in this telling. It references that more well-known version often enough that I can’t help but wonder why I didn’t just watch it instead. It’s heart is in the right place to begin with, which is why it works so well. That, and well, the gorgeous visuals, too. Nice review. Interesting, nice review! I didn’t remember the story at all from watching the Disney movie. I guess it was never my favorite. But my boyfriend dragged me to see this one over the weekend and I loved it. I forgot what a great story it is. Maybe that helped me appreciate it? Obviously, the visuals are amazing too, like you say, but I guess I liked the story more than expected too.